Home / how to / hrtc / tickets / How to book HRTC bus tickets online? How to book HRTC bus tickets online? It's well known fact that Himachal is doing well at IT front and most of the departments, organizations, corporations and boards of Himachal Pradesh govt. has gone Hi-Tech. HRTC is one such organization which has undergone technological transformation from vehicle tracking systems (VTS), electronic tickets to booking e-tickets online. 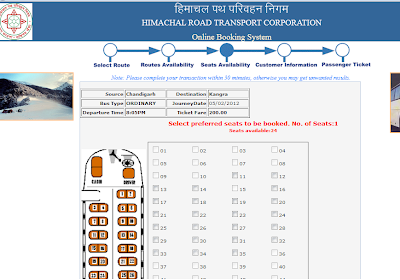 Over last 3-4 years online bus ticket booking system of HRTC has gone more stable and user friendly. The website which was having so many glitches and flaws in the booking and payment flow, has gone a long way since then. Now not only you can book tickets for Volvo and Him Gaurav but also for ordinary buses running on long routes. Though usability and design wise the website still has issues, yet it works most of the times :). For more information on booking, cancellation or refunds you can visit FAQ section of the website. Next time you plan to travel in Himachal, book your ticket online and share your experience.